Established by James Leland Dirks, Jr. in July 2012, the James Leland Dirks, Jr. Library Preservation Endowed Fund provides students in the UW Information School with hands-on learning in preservation. Applicants are expected to have a demonstrated interest in preservation and to be enrolled in the UW iSchool. Depending on the interests and strengths of the intern, they may contribute to a number of preservation initiatives including collections disaster planning, improving collections care, environmental monitoring, surveying or reformatting vulnerable collections, or preserving digital assets. This is a part-time (10 hours per week) internship during the academic year (fall through spring quarter). The position is typically advertised in late summer or early fall. My time as the James Leland Dirks Jr. Preservation Intern started with a splash! In my first week, I was called on to help respond to a leaky ceiling over book stacks, and with that, my year was off to an intense start, helping me gain professional hands-on experience with the various facets of preservation. One of my largest tasks as an intern was to help prepare the 2017 Disaster Plan for the University of Washington Libraries. I was excited to help complete the plan, and contributed by researching various materials, supplies, and local resources that would be needed in an emergency. I also worked on the disaster supply list, helping to stock Preservation Services with the materials and equipment that are needed for emergency use. Reviewing materials for commercial binding gave me the chance to see the full circle of Preservation work. By determining materials that are brittle, materials that can be reordered, as well as the many types and styles of binding, I am better able to discern which preservation methods might best ensure long term access to the materials and information they contain. Outreach is another area that allowed me to see the importance of preservation services. During my time as intern I worked on a website from a former exhibition at UW titled Time Will Tell, for the purpose of highlighting and promoting Preservation Week. Throughout this process I was able to share tips with our patrons for preserving their own collections, and through this we helped our patrons better care for the UW Libraries collections. This hands-on internship has cemented my intent to work in the preservation profession. I have enjoyed getting to know and work with the UW Preservation Services staff. Katrina Belton, is originally from Minneapolis, Minnesota and graduated with a BA in English from Gustavus Adolphus College in 2012. Graduating with a Master’s of Library and Information Science in August 2017, her area of studies at the University of Washington centered on preservation and archives. Katrina’s interests in archives and preservation come from her work as an undergraduate student and her love of libraries from her grandma, Grace Belton who was a librarian with Hennepin County Library. The James Leland Dirks, Jr. Library Preservation internship introduced me to many different facets of preservation and strengthened my understanding of the field. It has given me a chance to work on triage of incoming damaged materials, commercial binding, boxing, preservation replacement for brittle books, surveys of digital media and rare books in Special Collections, environmental monitoring, and outreach. The scope kept me busy and engaged, while giving me the chance to practice and learn new details each day. Being a part of the department has been rewarding. I have enjoyed the hands-on aspects especially. One of these tasks was compiling more than 20 years of intermittent correspondence and data about the temperature, humidity, and other environmental vulnerabilities for a particular collection area. I then accompanied Preservation staff doing a physical evaluation of the space. Looking at both historical data and the current space provided me a better understanding of how materials are affected by their environment. The internship also reinforced and expanded my knowledge of the physical construction of books by assessing the needs of books sent to preservation for repair. Learning how to recognize the many kinds of bindings as well as brittle paper were particularly interesting. Being able to share in the experience of taking care of collections has been both fascinating and fulfilling. The scope and guidance of the internship has given me a knowledge base of preservation as a whole while introducing me to the many pieces of a preservation program. I look forward to continuing in this field for many years to come. Marissa Gunning grew up in Boise, Idaho. She received her BA in Applied Linguistics from Portland State University in 2013. She became interested in pursuing a career in libraries in high school and graduated from the Masters of Library and Information Science Program at the University of Washington in June 2016. Her interest in preservation, archives, and metadata developed while studying linguistics. Marissa is particularly interested in how languages change over time and how these language changes are revealed and preserved in all documents. As the James Leland Dirks, Jr. Library Preservation Intern, I worked closely with Preservation staff on a variety of projects covering the many diverse areas of library preservation. From environmental monitoring to sorting damaged materials, I enjoy preservation because it is an active and ongoing process that helps to ensure that library collections survive are accessible and useable. It isn’t just putting things away in boxes for an undefined future use. Some of the notable projects I participated in were creating a Preservation Research Guide, updating the library disaster response plan to include more information on modern digital media, and preparing an information sheet for library staff on mold identification and response. I also worked with Special Collections staff to determine current lighting levels in their exhibition area and created lighting guidelines for future displays to help ensure the safety of the materials. An extremely damaged accession of mid-century materials from Vietnam was processed in order to determine the potential for preservation or replacement. It’s also not just about books and journals and old photos, but increasingly about how we will preserve the artifacts of our digital lives. With that in mind, I was fortunate enough to be able to integrate digital preservation into my Capstone Project, the final requirement for my degree. Under the guidance of Preservation staff, I looked into the digital preservation possibilities for a small collection of thesis materials on floppy disk and cds from the late 1980’s to 2011. Whether crawling under shelves looking for pest monitoring traps or soaking example materials in preparation for disaster response training, I’ve thoroughly enjoyed the hands-on training and guidance I’ve received during my time here and I look forward to continuing on in the field after graduation. Jesse Stanley is originally from Northeastern Ohio and graduated with a BA in History from Earlham College. 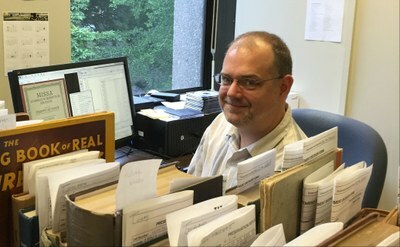 After many years working in the environmental community, he decided a career change was in order and was accepted into the Masters of Library and Information Science program at the University of Washington where he has focused on archives and preservation. Jesse graduated with his MLIS in June 2015. He credits his interest in the ephemera of history to his parents, who never listened to him when he complained about having to visit yet another museum, antique show or historical reenactment as a child.